The Pagosa Springs area is surrounded by over 3 million acres of National Forest and wilderness areas. The San Juan Mountains offer a variety of outdoor activities for you to discover and explore with hot springs, charming shops, historic sites, and an assortment of artisans, you'll find more than one reason to visit the Pagosa Springs area again and again. A plethora of rivers, lakes and reservoirs, the Pagosa Springs area gives anglers countless fishing opportunities. Warm waters are stocked with catfish, bass, perch and pan fish. The higher cooler lakes, creeks and ponds are teeming with pike, Kokanee salmon and a variety of trout. Other destinations don't come close to offering the spectacular fishing opportunities that the Pagosa Springs area does. Not only that, the Pagosa Quality Fishing Project stocks the San Juan River with trout during the summer. Some weighing up to 10 pounds right in the heart of downtown Pagosa Springs. Echo Canyon Reservoir: 5 miles south of Pagosa Springs along U.S. Highway 84 lies Echo Canyon Reservoir. This is a 118 acre State Wildlife Area and is a great for catching rainbow trout and large yellow perch. Ice fishing success greatly depends on using worm tipped jigs. The state record largemouth bass was caught here in 1997, measuring 22.5 inches long and weighing 11 pounds, 6 ounces. Fourmile Lakes: Drive Fourmile Road North out of Pagosa Springs until the road ends. From there its about 7 miles up to the first lower Fourmile Lake. The second higher lake is a half-mile further up the trail. This is a difficult and strenuous hike, but a determined angler will be rewarded with stunning views and gorgeous mountain lakes that contain cutthroat trout just waiting to be caught. Harris Lake & Buckless Lake: To reach these beautiful mountain lakes take US Highway 84 south for about 20 miles from Pagosa Springs until you reach Buckless Lake Road heading east. This will take you to the parking area where you can hike half a mile to Buckless Lake or a mile and a half to Harris Lake. These lakes contain some very catchable rainbow trout. Opal Lake: To get to Opal Lake head south on U.S. Highway 84 from Pagosa Springs for about 8 miles to Blanco Basin Road. Head east on Blanco Basin Road until you reach Castle Creek Road which takes you across the Rio Blanco. At the parking lot, Opal Lake is a beautiful 2 mile hike from the parking lot. Opal lake, the beaver ponds and the stream are great for brook trout. Turkey Creek Lake: To get to Turkey Creek lake, take US Highway 160 north 7 miles out of Pagosa Springs to Jackson Mountain Road. 5 miles west on Jackson Mountain Road is a parking lot where you can park and follow Turkey Creek about 9 miles up to Turkey Creek Lake. The hike delivers in the form of a breathtaking mountain lake that is home to brook, cutthroat and rainbow trout. Williams Creek Reservoir: Located 25 miles northwest of Pagosa Springs on Piedra Road (County Road 600). This road starts out paved then turns into a dirt road. Along the way to Williams Creek Reservoir the road crosses over a handful of tributaries to the Piedra River that could be taken advantage of by a perceptive fisherman. (see more info on the Piedra River below). Williams Creek Reservoir is a 508 acre mountain lake surrounded by mountains and forest. 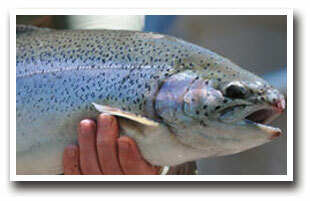 The reservoir contains excellent opportunities to catch brook and rainbow trout as well as Kokanee salmon. Fishing from motor boats, canoes, float tubes and the bank is permitted (though whitewater wake boarding is not permitted). * During the winter months, Williams Creek Reservoir is typically covered with 9 inches of ice and can provide ice fishermen success with jigs baited with meal-worms. *This is a State Wildlife area which requires a Habitat Stamp for persons age 19-64. Fourmile Creek: Fourmile Creek is a tributary to the San Juan River. To access this river, drive Fourmile Road North out of Pagosa Springs until the road ends. Fish along the creek from here up to the lakes. Fishing for cutthroat trout is good after the melt-off has dropped in mid-June. Navajo River: A 12 mile tributary to the San Juan that can be be accessed by two locations in Colorado. To the east at the town of Chromo and west near Pagosa Junction. The Jicarilla Game and Fish Department are restoring fishing habitat to protect 3 rare native fish. 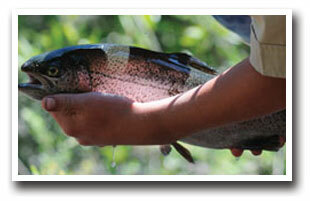 The Navajo River allows tribal and non-tribal fisherman to catch rainbow and brown trout. There are also many campsites along this breath taking river. Piedra River: The best way to access this water-fall laden river is to travel 25 miles northwest of Pagosa Springs on Piedra Road (County Road 600). This road starts out paved then turns into a dirt road and also leads up to Williams Creek Reservoir (see description above). The Piedra River is a great brown, rainbow and brook trout stream. The Piedra River to the Lower Piedra can only be fished with artificial flies and lures. There is a 2 trout, 16 inches or larger, bag limit. Rio Blanco River: About 10 miles south of Pagosa Springs along US Highway 84. The Rio Blanco River comes from the San Juan Mountain range and is a tributary to the San Jan River. Due to a major trans-basin diversion - the San Juan/Chama project - water sometimes runs at reduced flows and can cause pour fishing conditions and a loss of fish habitats. 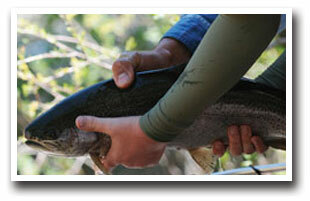 When fishing is good, the river is well known for brown trout, brook, and rainbow trout. Rito Blanco River: About 8 miles south of Pagosa Springs, and can be accessed by Highway 84. When the conditions are right, 7-12 inch brown trout, rainbow trout and brook can be caught. San Juan River: The pride and joy of the Pagosa Springs area. This great river starts just south of Wolf Creek Pass along US Highway 160. It travels south through Pagosa Springs and into the Southern Ute Indian Reservation where it eventually empties into Navajo Lake/Reservoir. When the snowpack is good, the San Juan provides productive fishing during the summer and throughout most of the fall. The San Juan offers spectacular fishing for rainbow and brown trout and is ideal for the fisherman who doesn't want to travel far since it runs right through downtown Pagosa Springs. Turkey Creek: Is also a tributary to the San Juan River. You can access Turkey Creek just as you would Turkey Creek lake, take US Highway 160 north 7 miles out of Pagosa Springs to Jackson Mountain Road. 5 miles in on Jackson Mountain Road the road ends at a parking lot where you can take the trail and follow Turkey Creek 9 miles up to Turkey Creek Lake. After the high water melt-off in mid June, Turkey Creek is a great source for fishing brook and cutthroat trout. 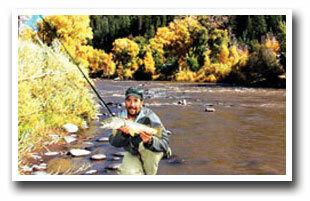 The Pagosa Springs area offers countless fishing opportunities for the avid angler. Along the San Juan River and its multitude of tributaries are areas that are fun and challenging for all skill levels. The Pagosa Springs area also offers multiple lake and reservoir fishing areas that are great destinations for the whole family. Spend a week just exploring the areas lakes, reservoirs, creeks and rivers. Pagosa Springs has lodging, fuel and plenty of camping and RV sites.